Now that I am back at work full-time I don't have as much time to put together craft activities and play invitations for my girls as I did when I was on Parental Leave. I really miss getting out the paint and glue and letting them get creative. Despite the inevitable mess, I love witnessing them make new discoveries; mixing colours, figuring out how to draw ears or skirts, learning how to hold the scissors and paper just the right way so that they can cut a straight line and proudly hanging their finished masterpieces on the fridge using 75 magnets. They are attending an amazing Naíonra (Preschool) for three hours each day, and come home with bulging folders of artwork every few weeks, but I still feel guilty for not providing as many opportunities for creativity at home as I used to when I was at home full-time and even before that when I worked a 4-day week. Devo is a wonderful father and the girls benefit hugely from being at home with him everyday. 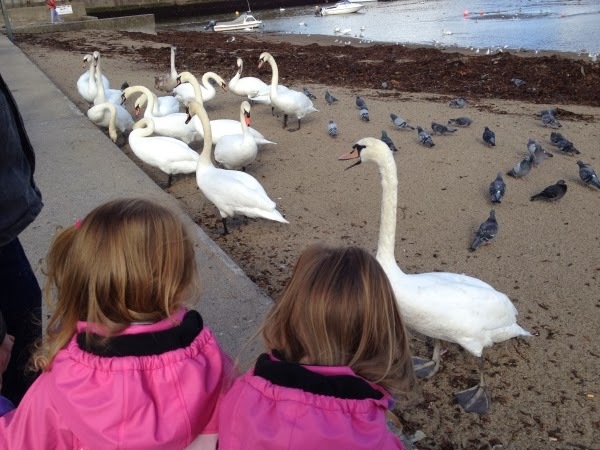 They spend a lot of time outdoors, with walks on the beach and trips to the playground every week. He brings them on playdates with friends and visits to their grandmother. 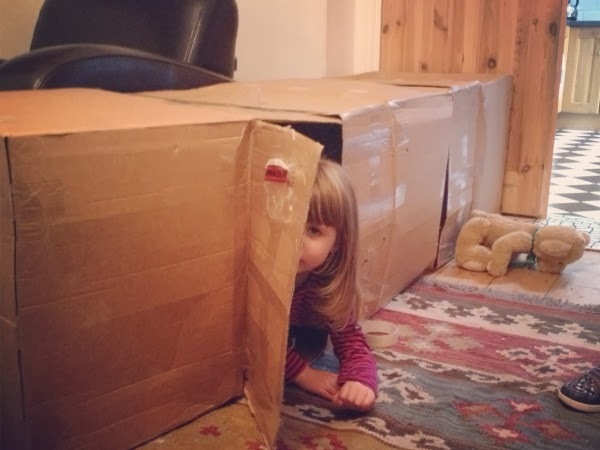 Other afternoons he builds elaborate blanket forts and indoor obstacle courses, which the girls call 'play centres', that take up the entire living room. He brings them to the supermarket too - which is hard work, I can tell you- and they help by touching every. single. thing in the shop. He also sits at the table and draws or colours with them for hours but, as far as arts and crafts is concerned, that's about as far as it goes for him. He has a much lower tolerance for creative mess than I do, and that's ok. I have less tolerance of walking on the windy beach in the middle of Winter! My mother was at home with us when I was growing up and I know that we painted every single day of my entire childhood. After school, before homework, she would sit us up at the newspaper covered table with old margerine tubs full of poster paint and reams of paper from someone's office and soon every surface in the kitchen would be covered with drying masterpieces of every hue. 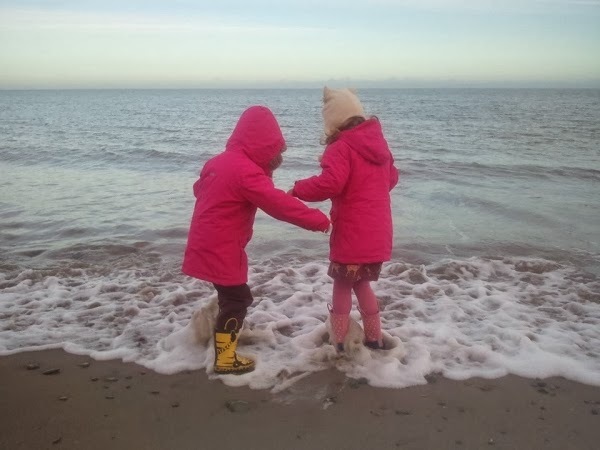 It is a very happy memory and one that is obviously the inspiration behind my drive to provide as much opportunity as possible for creative fun as I can for my little ones. Right now, I can't be at home with the paint ready everyday, but I still want to provide a way for my girls to be creative without me. I wanted to find a way for them to complete a craft or create something themselves with minimum mess for Daddy to clean up and with minimum help from anyone. They are not yet 4 years old, so that's a pretty tall order! I mentioned a few weeks ago that I had had an idea about how to do this and now I have pulled the beginnings of it together. It is something that will need brainstorming (pinteresting!) sessions from time to time too, but I am going to start trying it out with the girls next week. I have a little photo shoot planned for the weekend, when I'll be able to take pictures in daylight, in case you'd be interested in trying my idea too, so keep an eye out for a post early next week - when I will reveal all! Slightly terrified I've built it up too much now! It's a really simple idea! I found the same thing happened when it was back to work for me after my parental leave, crafty goin' ons plummeted. How I miss that level of crafty goodness! My children spend their weekdays with their dad too, and while he does the homeschooling, crafting is just not his thing. That falls entirely in my domain. So weekend crafting it is. Thanks for stopping by! I try to do weekend crafting as much as possible, but with catching up on chores, and going to birthday parties and spending time with friends and family there's never a lot of time then either. It's so hard! !